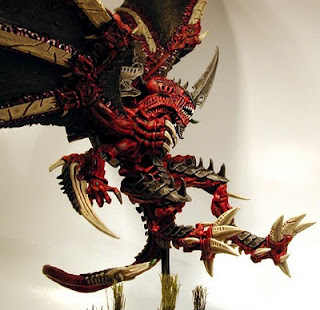 Modern Synthesist: Hive Fleet Moloch: GOZILLA Swarm! In the Piece of the Hive Mind introduction, I mentioned that Moloch used to have a pretty decent relationship with some of the lads in the Studio. Never was this relationship more decent than in the run up to the 4th Generation/Edition Tyranid release. 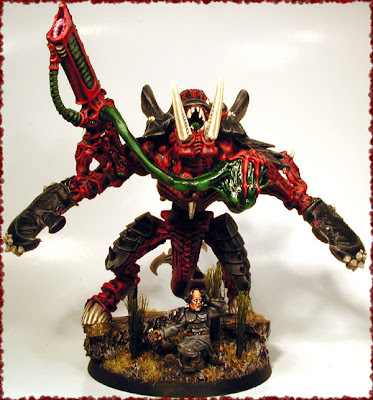 While we were all hmmm'ing and hawwww'ing, trying to figure out what, exactly, a plastic Carnifex was exactly supposed to look like, Moloch was lucky enough to already have his hands on the kit. No, sorry, wait. 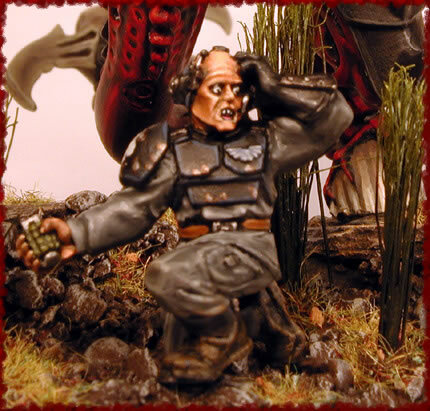 He was lucky enough to already have his hands on SIX of the kits, and two metal Hive Tyrants to boot! The studio had supplied him with the models early with the understanding that he would convert and paint them up to represent a Godzilla swarm: a Hive Fleet list that maxed out the number of Tyranid Monstrous Creatures you could include at 8! This seems like small potatoes these days, where Harpies and Tervigons mean that the most TMCs you can fit in a list is 17 (Do the math: 2 Tyrants/Tervigons as HQ, 3 Tervigons as Troops alongside three broods of Termags, 3 Harpies as Fast Attack, and 3 units of 3 identically equipped Carnifexes as Heavy Support. Now, that isn't to say you could actually cram all that into a normal point limit...), but back in 4th Edition, the idea of the Godzilla swarm struck fear into the hearts of Marines everywhere. 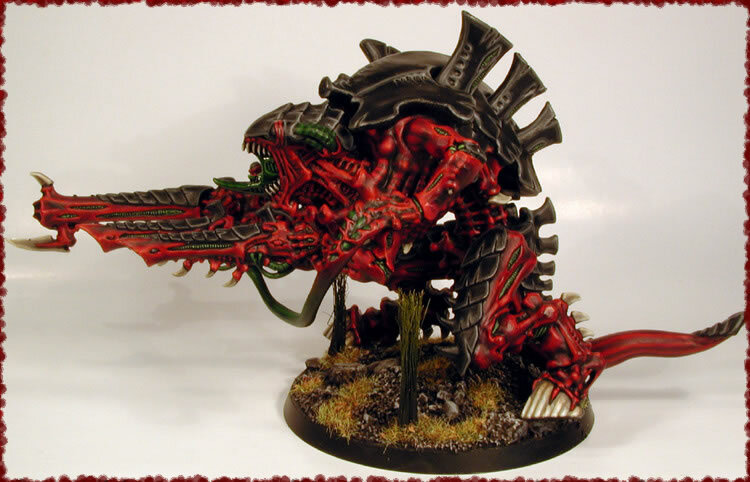 The studio entrusted Moloch to make this newest of Tyranid monster lists look good, and I think he may just have exceeded their expectations! 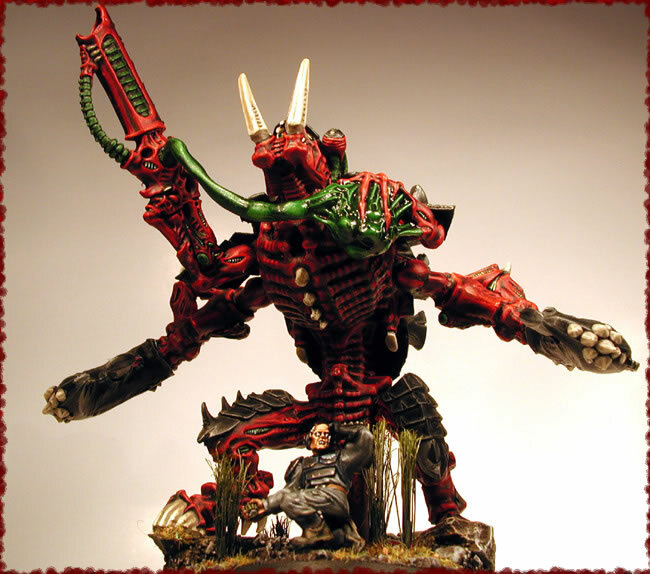 Now, I am, once again, limited by only having access to the photos I could mine form the Way Back Machine/my computer/the Warpshadow galleries, but I think I've got a goodly cross section of the creations Moloch came up with. 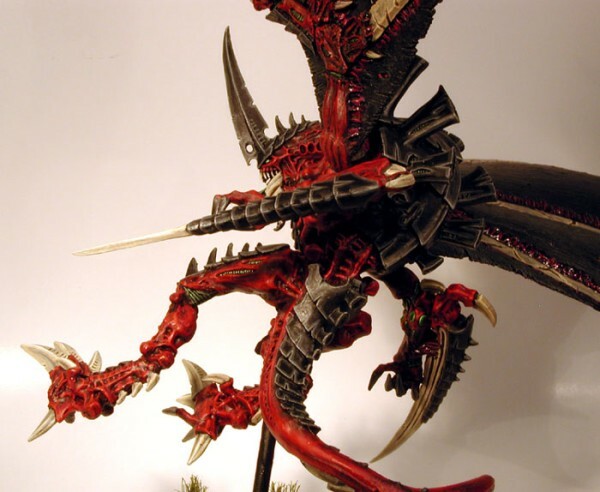 Most famous from the Hive Fleet Moloch Godzilla swarm is, likely, the Winged Hive Tyrant. Moloch has always been adamant that a flying Hive Tyrant should have claws for walking on, not hooves, as they are far more useful for snaring prey from the air. 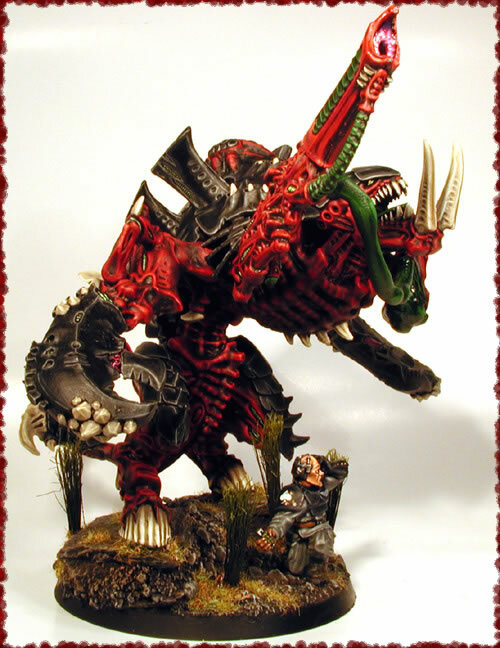 He also prefers giving Tyrants Rending Claw hands rather than scything talons as, when it comes to the look of the model, he maintains that the hands look far more intelligent than limbs ending in giant knives. 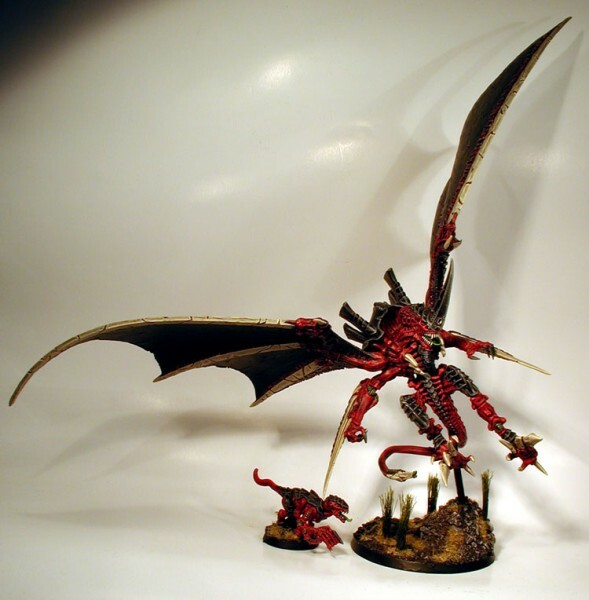 This Tyrant's impressive wingspan is compliments of the Forgeworld Winged Tyrant kit. 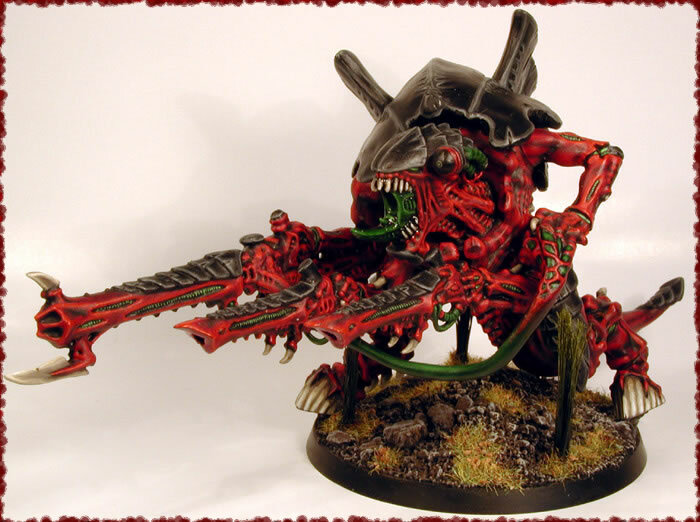 Next up are the Godzilla swarm's Elite Carnifexes. 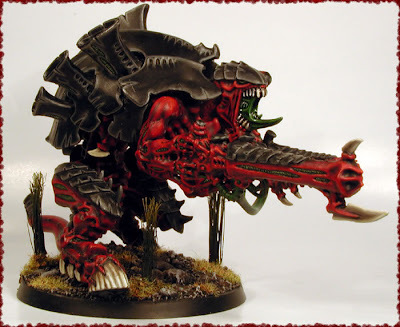 Like I mentioned in the 4th Generation Tyranid Archive article, the 4th Edition Codex introduced a new rule that, so long as a Carnifex was below a certain points threshold, it could be fielded as an Elite unit, rather than a Heavy Support unit. 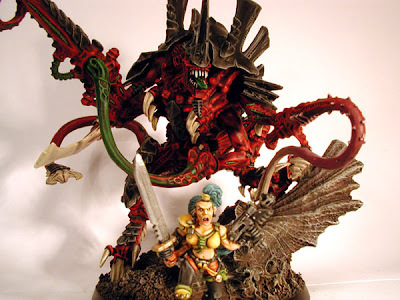 It was the first time that Tyranid players had ever seen a Tyranid Monstrous Creature outside the HQ or Heavy Support slots, and we took it as a godsend. A popular option for these Elite 'Fexes was to 'dakka them up with some devourers or just keep them as simple combat creatures. 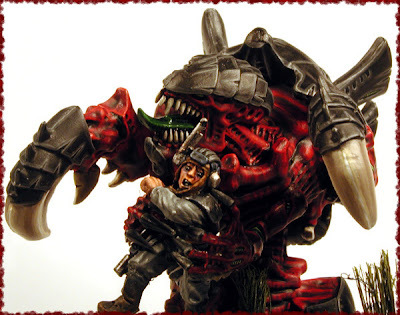 Moloch had a third Elite 'Fex that went by the moniker "ATATFex" or something similar, and I think it was the one that was running full-tilt towards its enemy. 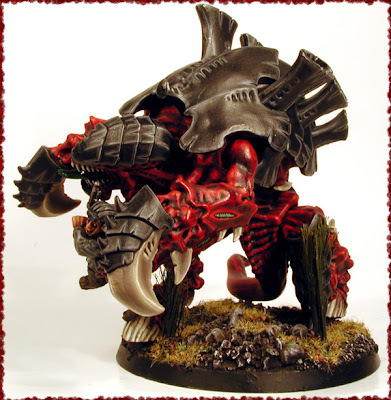 One thing that should be noted about Moloch's Elite 'Fexes is the way that he has moved the second set of limbs onto the creatures' chests and covered over the rear arm slot with armour plates. 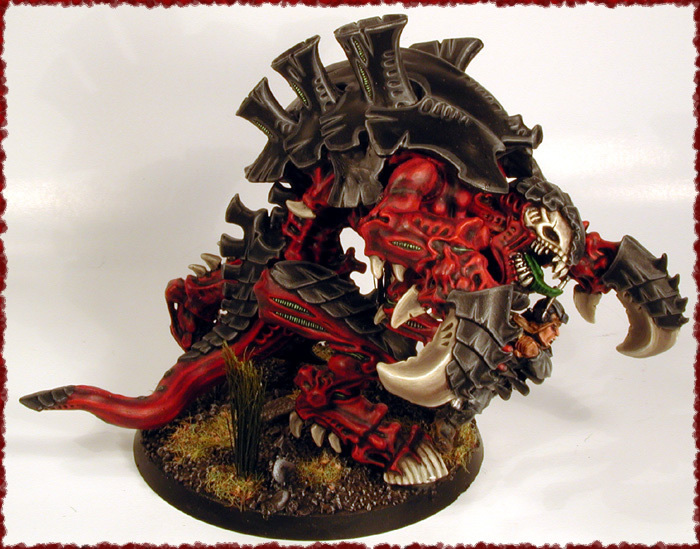 I can't explain why this makes the beasts look so good, but I've always loved the effect...particularly on that Dakkafex. 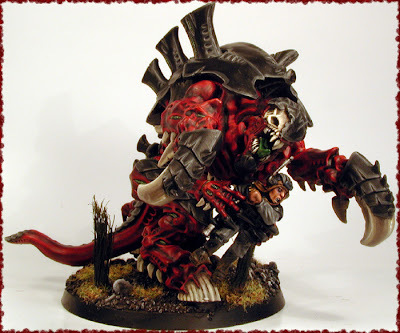 Another point of interest would be the odd choice to equip a Carnifex with Rending Claws, which seems kind of foolish at first glance as a Carnifex, by virtue of being a TMC, already negates armour and gains an extra armour penetration dice in close combat. 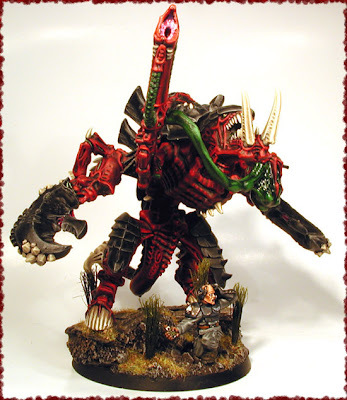 The reality was that, in 4th Edition, Rending Claws were an cost-cutting option as they were so cheap on a Carnifex (cheaper even than Scything Talons, IIRC) that using them to fill one weapons slot made it easier to get a Carnifex in under the point ceiling for fielding it as an Elite unit. Next up, we have the real big boys of the Godzilla swarm: the Heavy Support Carnifexes. 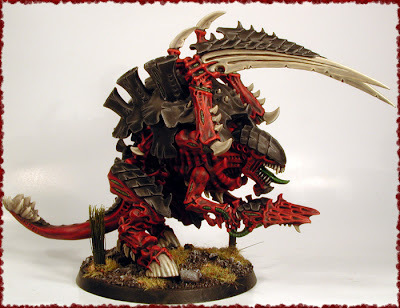 Just as the biomorph options available in the 4th Edition Codex made it possible to field stripped-down, cheap-o 'Fexes, they also made it possible to field some real monstrosities, and Moloch capitalized on this by loading up on biomorphs for some of his Heavy Support 'Fexes. First up is the Broadside 'Fex, which some also called a "Gunfex" back in those days. This model capitalized on the fact that Carnifexes were free to choose two ranged weapons, and their rules as Monstrous Creatures allowed them to fire both weapons in the same turn. Big Deal, you may say, as Carnifexes can still take two sets of ranged weapons today. 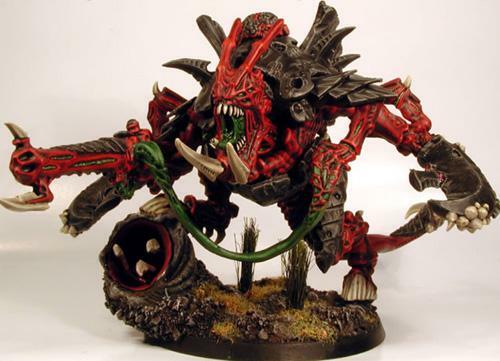 However, the loophole that made the Gunfex so useful in 4th Edition was the fact that it could take both a Venom Cannon AND a Barbed Strangler. Next, we have the Roar 'Fex, which went a long way to demonstrating just how tall a Carnifex kit could stand, while also showing off the Carnifex's Screamer-Killer herritage. This is also an example of how Moloch chose to use the old, pewter, Old One Eye crushing claws on his larger, Heavy Support Carnifexes to distinguish them from the smaller Elite ones. Finally, we have the most ridiculous monster of them all: the Scar 'Fex. 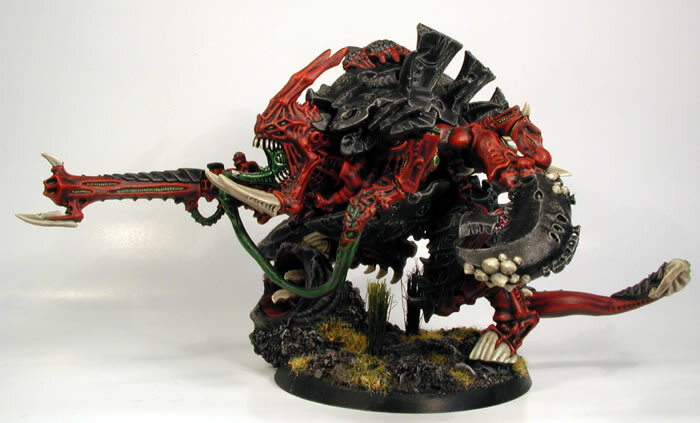 I'm pretty sure that Moloch commented that he loaded this Carnifex with nearly every biomorph in the book, topping it out at something very near 300 points! Now, I'm pretty sure that the Godzilla swarm showed up in an issue of White Dwarf along the way--in fact, I probably have it somewhere amid my boxes of them. 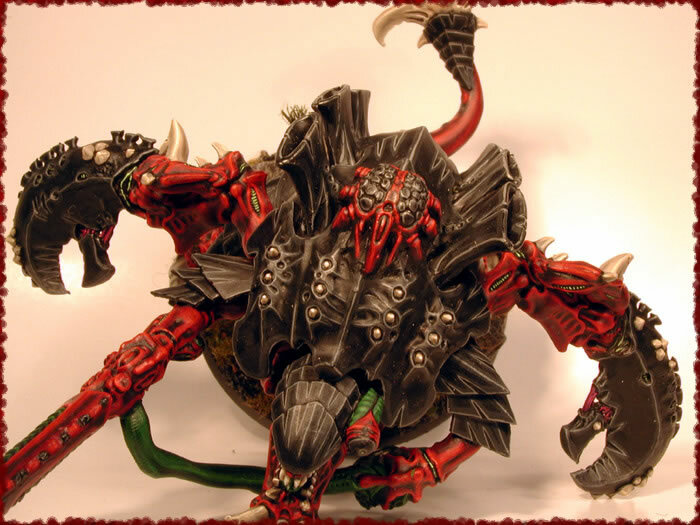 However, I haven't yet had the chance to find that WD, so if anyone can remember a White Dwarf with this swarm in it, let me know and I'll see if I can pull the issue. 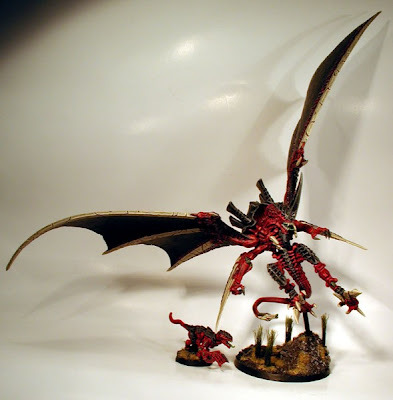 Though this is the last of the Hive Fleet Moloch articles I'll be putting up, Moloch didn't stop with his eponymous hive fleet when it came to creating amazing Tyranid conversions. 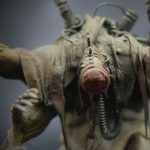 His work on Hive Fleet Moloch was not only noticed by the Games Workshop Studio; it had also caught the attention of Forgeworld. 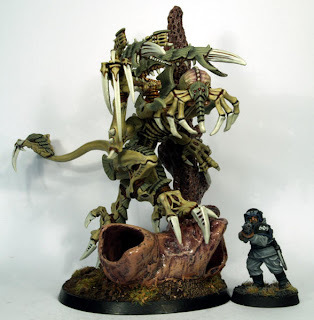 And, when it came time for Forgeworld to publish the Imperial Armour: Anphelion book, they came to Moloch, asking him to convert up and paint some bugs for the publication. He took the job, but he wasn't going to paint them up in his same old Hive Fleet Moloch scheme. 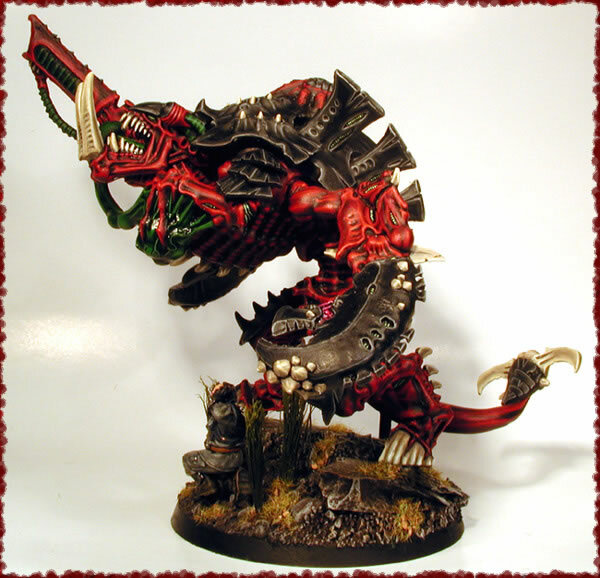 Instead, he came up with a new scheme, and he called it Hive Fleet Ouroboros.